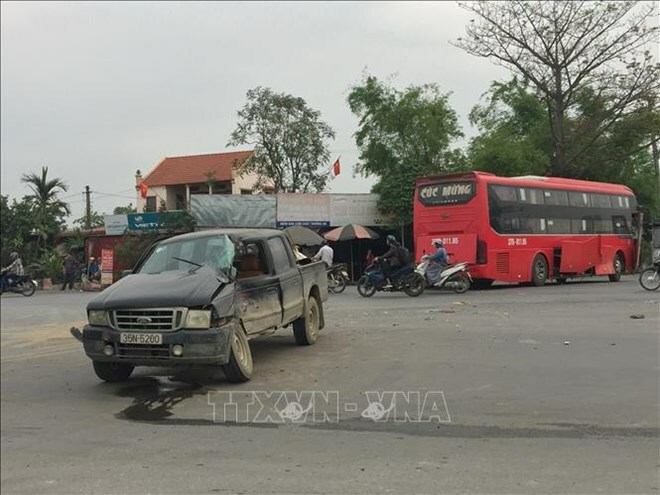 Hanoi (VNA) – A total of 66 people were killed and 60 others were injured in 97 traffic accidents during the Hung Kings Commemoration Day holiday, which started on April 13. According to the Traffic Police Department under the Ministry of Public Security, during the three-day holiday, there were 95 road accidents, claiming 65 lives and wounding 59. In addition, one person was killed and another was injured in two rail accidents. In the period, police handled about 13,730 road traffic violations, with total fines of more than 12.6 billion VND (about 543,000 USD). Some 1,600 vehicles were seized and 18,340 drivers had their licences revoked. Meanwhile, waterway traffic police dealt with 947 violating cases, with fines worth 936 million VND (about 40,330 USD). On April 15, the last day of the holiday, 33 traffic accidents took place nationwide, all of them road accidents, resulting in 25 deaths and 18 people being injured. Some severe accidents were reported in the holiday. One of them occurred in the central province of Thanh Hoa on April 15, leaving three students on a scooter dead after crashing into some construction materials.